Cheap bistro patio furniture can add a casual yet chic element to your outdoor space. Bistro sets typically consist of a small round table and two matching chairs and more often than not they are very moderately priced. Perfect for casual dining and intimate conversation, bistro sets conjure up images of outdoor cafes in romantic cities like Paris and Rome. They can often be found outside of cafés and (obviously) bistros. But despite their European style, they work quite well in a variety of outdoor settings. Casual or formal, modern or traditional, just about any outdoor space can benefit from a bistro set. Bistro sets are often made of wrought iron, but they aren't limited to it. They can sometimes be found in wood, various types of metals (powder coated steel is fairly common), and if you're looking for cheap bistro patio furniture you can get one made of plastic or resin. The design is always fairly simple, but they sometimes have elegant designs worked into the material. Bistro sets are never large. They can fit easily into small spaces and awkward areas where larger pieces can't fit. Tables are usually about 35" high and 20" to 30" in diameter (bistro tables are always round). The chairs fit comfortably around them and the seats can slide under the tabletop. The small size is what makes them so practical for cafes and bistros. A lot of sets can fit into a small area (such as the patio or sidewalk outside a café) and they don't require much table surface to accommodate large plates like a restaurant would. Choosing a bistro set is like choosing any other type of outdoor furniture. You'll want to find something in a style and color that complements the rest of the area. Think about whether you want it to stand out and draw attention or blend in with the surrounding area. Be sure also that a bistro set will be large enough to suit your needs. They're ideal for small meals, snacks and drinks, but they rarely have enough surface area to accommodate larger plates and accessories. With so many people downsizing to small condos and apartments, and with outdoor living spaces getting smaller and smaller, it seems as though bistro sets are more popular than ever. They can fit onto small balconies, patios, and porches, making them a great option for people with small outdoor areas. Pretty much any store that sells outdoor furniture will have at least a small selection of bistro sets. Check out stores like Hauser. Large home improvement stores like the Home Depot and Lowe's should also have something during the warm weather seasons. Don't forget to check out stores like Target, Walmart and other inexpensive department-style stores as well. If you'd like something with a bit more history and vintage flair, be sure to check out flea markets and antique sales. 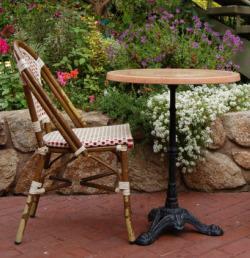 Vintage bistro sets can often be found since they've been around for many years and are always in demand. You can even find them on auction websites like eBay. Occasionally they will be slightly rusted or have flaking paint, but for antique lovers it only makes them more charming. They make wonderful garden accessories and add a real sense of history. Bistro sets have been popular for many years and they will likely remain so. Bistro sets are enduringly chic and add a bit of flavor to your outdoor living space. They say good things come in small packages, and when it comes to bistro furniture it's certainly true.